Cut the steak into 1½ inch cubes and place it in a shallow dish or resealable plastic container. Pour the Island Teriyaki sauce over top and turn until evenly coated. Cover and marinate in the fridge for 3½ hours. When the meat is ready, discard any leftover marinade. Soak 8 wooden skewers in water while prepping (for at least 30 minutes). Chop the peppers and red onion into large squares. Cut the pineapple into 1½ inch wedges. Combine in a large mixing bowl and toss with olive oil and season to taste with salt and pepper. Thread the beef, fruit, and vegetables onto skewers. 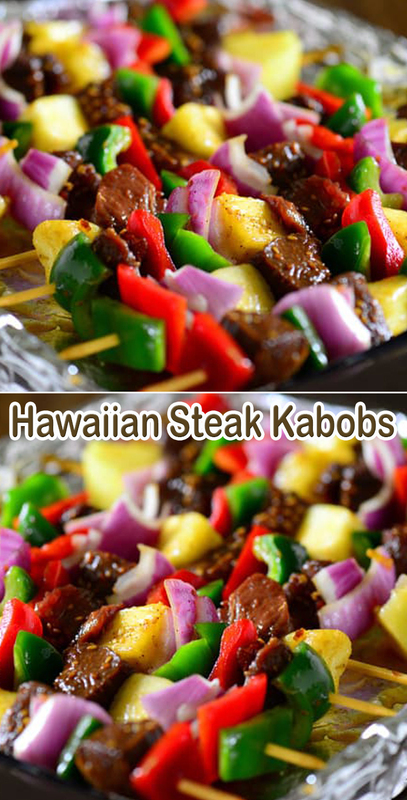 Cook the kebabs on the grill, over medium-high heat turning occasionally until veggies are tender and the beef has reached an internal temperature of 145ºF. Baste with extra Island Teriyaki sauce.